Q. Do the Campus Libraries have Anatomy Models? 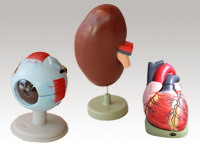 All five campus libraries have a variety of anatomy models on reserve for A&P classes. Students can check them out for use in the library for four-hour periods. Since quantities are limited, they cannot be reserved ahead of time, but students can work in groups to study the models. Contact each individual campus to see which models are available. The library also has an online digital Anatomy database--The Visible Body--that students can access anytime by logging into the Electronic Resources.